Citation Information: J Clin Invest. 2018;128(8):3280-3297. https://doi.org/10.1172/JCI97459. Tumor angiogenesis occurs through regulation of genes that orchestrate endothelial sprouting and vessel maturation, including deposition of a vessel-associated extracellular matrix. CD93 is a transmembrane receptor that is upregulated in tumor vessels in many cancers, including high-grade glioma. Here, we demonstrate that CD93 regulates β1 integrin signaling and organization of fibronectin fibrillogenesis during tumor vascularization. In endothelial cells and mouse retina, CD93 was found to be expressed in endothelial filopodia and to promote filopodia formation. The CD93 localization to endothelial filopodia was stabilized by interaction with multimerin-2 (MMRN2), which inhibited its proteolytic cleavage. The CD93-MMRN2 complex was required for activation of β1 integrin, phosphorylation of focal adhesion kinase (FAK), and fibronectin fibrillogenesis in endothelial cells. 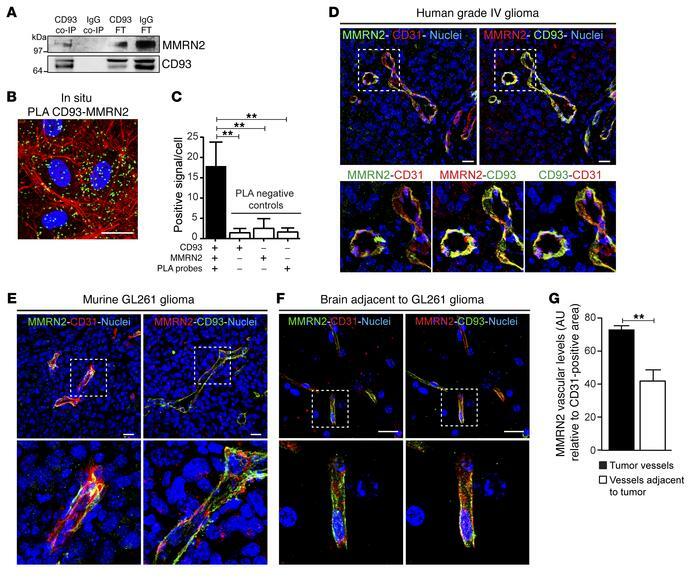 Consequently, tumor vessels in gliomas implanted orthotopically in CD93-deficient mice showed diminished activation of β1 integrin and lacked organization of fibronectin into fibrillar structures. These findings demonstrate a key role of CD93 in vascular maturation and organization of the extracellular matrix in tumors, identifying it as a potential target for therapy. CD93 interacts with MMRN2 in endothelial cells and colocalizes with MMRN2 in tumor vasculature. (A) Western blot against MMRN2 in CD93 coimmunoprecipitated samples (CD93 co-IP) derived from total protein lysates of HDMECs. A nonrelevant IgG antibody was used as negative control (IgG co-IP). CD93 FT and IgG FT represent the flow-through of the unbound fraction. (B) In situ proximity ligation assay (PLA) for CD93 and MMRN2 in cultured HDBECs. Positive signal (green dots) indicates proximity between CD93 and MMRN2. F-actin was stained by phalloidin (red) and nuclei by Hoechst (blue). Scale bar: 20 μm. (C) Quantification of CD93 and MMRN2 interaction based on the number of positive signals per cell (n = 3 independent experiments). Nonspecific signals (PLA negative controls) were also examined. **P < 0.01; 1-way ANOVA with Dunnett’s multiple-comparisons test. (D–F) Immunofluorescent staining of MMRN2, CD93, and CD31 in human grade IV glioma vessels (D), in orthotopic GL261 glioma vasculature (E), and in nontumor brain vasculature adjacent to a GL261 tumor (F). Scale bars in all pictures: 20 μm. (G) MMRN2 quantification in tumor and nontumor vessels of WT (n = 3) and CD93–/– (n = 3) mice. Values represent mean ± SEM expressed as arbitrary units (AU) of MMRN2-positive area normalized by CD31-positive area. **P < 0.01; 2-tailed t test.